BUNCOMBE COUNTY, NC -- A mountain family in North Carolina had an unexpected visitor with a sweet tooth over the weekend. 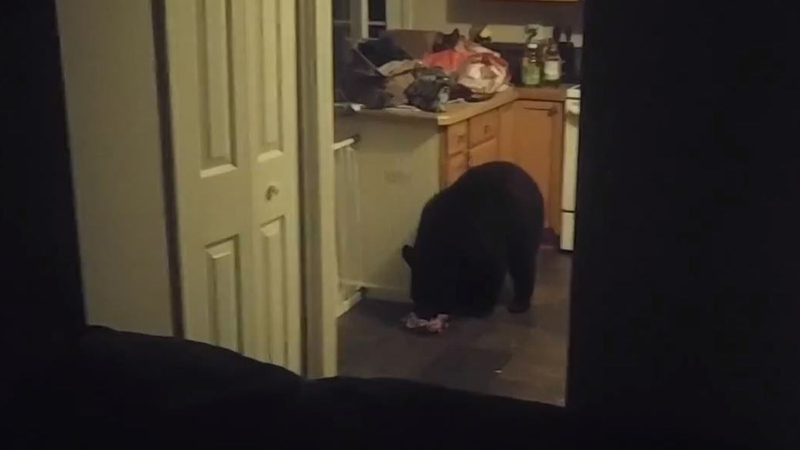 A bear made its way into a home in Buncombe County early Friday morning, WLOS reports. The family caught it all on camera as the furry intruder ate an entire bag of Hershey's Kisses and then headed for the bathroom. Ashley Snyder was home with her young children around 5am when she started hearing crinkling from the kitchen. Her husband Benjamin then woke up and eventually managed to get the bear out of the house. While not completely sure how the bear got in, Ashley said she thinks she may have left the back door unlocked and the screen door open. She says she's grateful her husband knew "exactly how to handle this ridiculous situation."